Sometime during the last 30 years or so, brides have been given permission to take control of their weddings. Or perhaps I should say, brides have taken control of their weddings. During the previous generations, all weddings were basically the same. My mother’s wedding probably looked a lot like her best friend’s wedding. You get the idea. But the times have changed and my daughter’s wedding looked nothing like her best friend’s wedding. Each reflected the personality and style of the bride. No longer confined by cookie cutter “traditional” molds, the brides of 2015 have the freedom to only be limited by their own imagination. There are venues to suit any style and wedding planners who are creative and resourceful. If a bride can dream it, it can usually grow from those planning stages into the wedding of her dreams provided, of course, that budget and time are on her side. So, with all this freedom to create a wedding that has her own signature style stamped on every component, how in the world does a bride channel all her ideas into the day of her dreams? One of the best ways is to simply browse the web. And thanks to wonderful photographers and their ability to put together fantastic styled shoots, Pinterest and popular blogs are full of their inspirational work. If you have followed our previous blog postings, you know that we definitely enjoy participating in styled shoots and doing so allows us to see some great wedding ideas in their planning stages. One such shoot took place on a very cold November day. This particular shoot was designed, coordinated and photographed by one of our favorite photographers in the Charlotte area, Casey Hendrickson, of Casey Hendrickson Photography. If you are looking for what I would call a rustic elegant style, this shoot is full of inspiration. The stark winter woodland background serves as a great point of contrast to the striking plum and gold color theme. Delicate china placed on weathered wood, flowers surrounded by antlers, and candles hanging from tree branches all add interest and individual style. If you are planning a winter wedding, we hope these photographs can serve as an inspiration to you. We encourage you to find your own personal style to create the day of your dreams. We would love to work with you to design table settings that reflect that style and make your wedding reception picture-perfect. Vintage china and the beauty of nature combine to set the perfect table for this wedding featuring a rustic elegant style. For more pictures see Ruffled.com and the full gallery of pictures click HERE. When we started Evermore, we knew we loved weddings, we loved parties, and we loved vintage décor. We knew we would enjoy working with brides and hostesses to help them create the perfect look for their wedding or special event. We knew we would be thrilled to see our items become part of someone’s real life fairytale. But what we didn’t know was how much we would LOVE styled photo shoots. It just never occurred to us that selecting, organizing, crating, carrying, hauling, unpacking, repacking, hauling back and re-inventorying could result in so much fun! But now we know! We had the opportunity to take part in two styled shoots a few months ago, both of which left us in awe of the many talented professionals with whom we had the pleasure to work. And we discovered that it truly is like playing make believe with the most wonderful props you can imagine. (Plus the venues are incredible). Both shoots featured pieces of our Vintage Gold China Collection, but the styles were surprisingly different. And we were giddy with the excitement of watching the creative minds of several different companies come together to create picture perfect scenes! The cake, especially designed for the shoot by Sky’s the Limit in Concord, was an amazing pink and white creation, with just a touch of gold, to serve as a very fitting focal point in many of the shots. We were also happy to be able to work with another of our favorite vendors….SugarPops! They know how to do “sweetness” right! 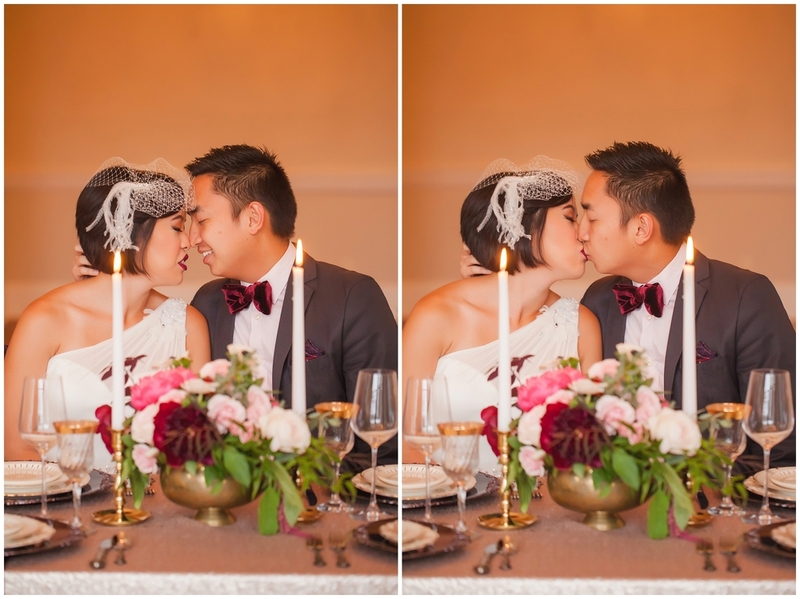 From gorgeous hair and makeup perfected by Beauty by Nou to the bridal gown and tux from Fabulous Frocks and Revolve Upscale Men’s Consignment, everything reflected a New Year’s Eve wedding at its most elegant. No detail was overlooked including the creative stationary items designed by Sweetest Beginnings, jewelry from The Bead Lady, and even festive masks from Ruby Heart Pearl. And the bride and groom certainly looked like they were enjoying the occasion – such picture perfect professionals! And then, to bring it all together, there was Casey Hendrickson of Casey Hendrickson Photography. Casey has the magic touch! We had never worked with her before and were thrilled to be a part of one of her shoots. We can’t say enough about her talent, creativity and ability to get just the right shot. Look for the next installment of this blog: Our second photo shoot with Casey Hendrickson Photography, which featured the perfect combination of rustic elegance. You’ve barely had time to get used to the feel of the engagement ring on your finger and it’s already starting….the planning. When? Where? How many people? Attendants? What kind of dress? And in there somewhere, probably very close to the beginning stages, comes the question of colors. And make no mistake about it, choosing your wedding colors is one decision that sets the stage for much that follows, such as bridesmaids’ dresses, cake design, reception décor, flowers, and the list goes on. Many of your guests may forget what your cake looked like, have no idea what you danced to, what your signature drink was or what you said in your vows, but they, more than likely, will remember the colors. Are there any prominent colors in the venue? If so, you want to be careful not to clash with them, but to incorporate those colors into your color palette, creating a pleasing overall effect. What colors are most complimentary to your attendants? They are excited to be part of your big day. Why not choose a color that will flatter them? They want to look great for the pictures too. Do your colors help set the mood? If you want a romantic feel, perhaps the paler hues would do the trick. Looking for more of a dramatic effect, head toward the brighter/darker shades. Do you want to incorporate your favorite flowers? In that case, your bouquet might be the starting point for color selection. When and where is the wedding? Season of the year and climate might also help with color selection. Specific times and places tend to inspire certain color combinations. Are you influenced by what’s trendy? Do you want to incorporate the popular colors of the year? If so, you will want to consult the Pantone Fashion colors to find the perfect shades for your perfect day. What do you like? It’s your day, your wedding, your dream. Be sure you don’t allow others to influence you too greatly or talk you into using colors that just aren’t you. Yes, you want things to complement each other but you want your wedding to reflect your style. Hold true to yourself and it will be the wedding of your dreams. We, at Evermore, would love to help you incorporate your chosen colors and style into your décor. We specialize in classic and vintage wedding rentals. Not only do we offer specialty and basic rental items, we also offer an extensive collection of china in a wide variety of colors and patterns to add the perfect touch to your tables. 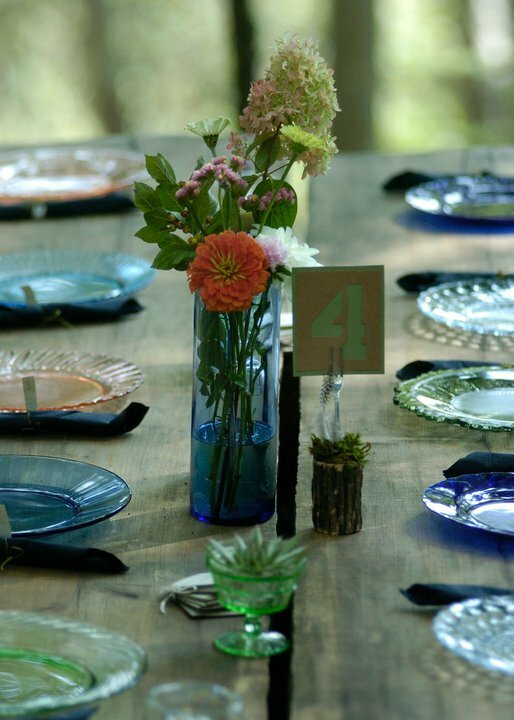 Please check out our collections and allow us the opportunity to work with you to select rental items that accentuate your colors and style, right down to the place settings. Here are some examples of our china patterns that coordinate with the Pantone Color Selections for Spring 2015. The Pantone color is listed first followed by the china pattern. 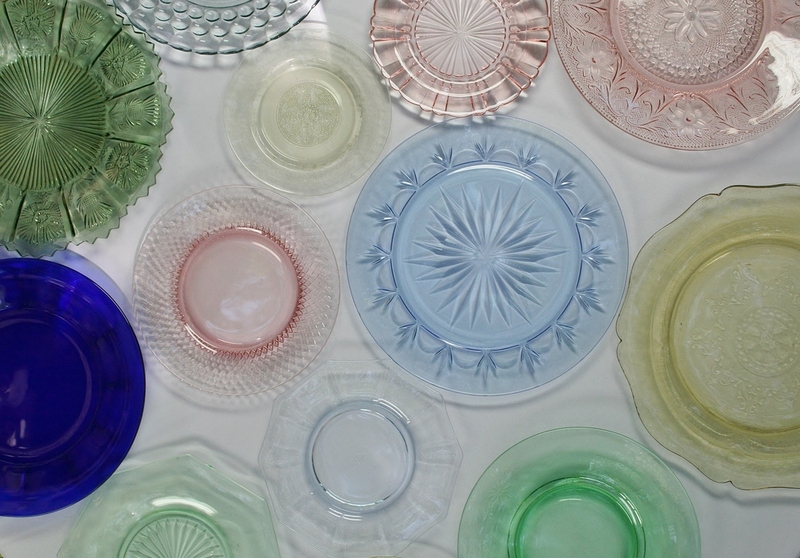 One category of inventory that we have a lot of interest in and confusion over is our Depression Glass Collection. Why would you want to use anything related to depression on the happiest day of your life? Because, other than your great-grandparents, it’s one of the best things that came out of the Depression Era. It’s beautiful and the perfect complement to your table, always managing to stand out for its uniqueness and gorgeous colors. And, it’s versatile, working well with a rustic or elegant theme, depending on how you style it. Basically, Depression glass is dinnerware of colored or clear glass, featuring many different patterns and designs. It was a giveaway with various purchases during the Depression and was used to entice consumers to buy a certain product or service. Through the years, its popularity among collectors has grown, causing it to be more difficult to find and more expensive to buy in today’s market. We are very proud of our vintage Depression Glass Collection here at Evermore. Our collection features patterns in beautiful shades of pink/peach, blue, green, yellow and clear. We have place setting for sizable gatherings, including dinner plates, salad plates and dessert plates, along with service pieces galore. If you are planning a wedding or special event, please check out our collection. We will be glad to work with you to coordinate with your color scheme. Depression glass for the happiest day of your life? You bet! Its beauty is far from depressing and the message it sends is one quite appropriate for such an important day. Depression Glass: Created with care, given freely, providing consolation to weather the hard times, celebrating the special occasions, and always offering a life of beauty and purpose. May that be a reflection of your love on your wedding day and every day…..